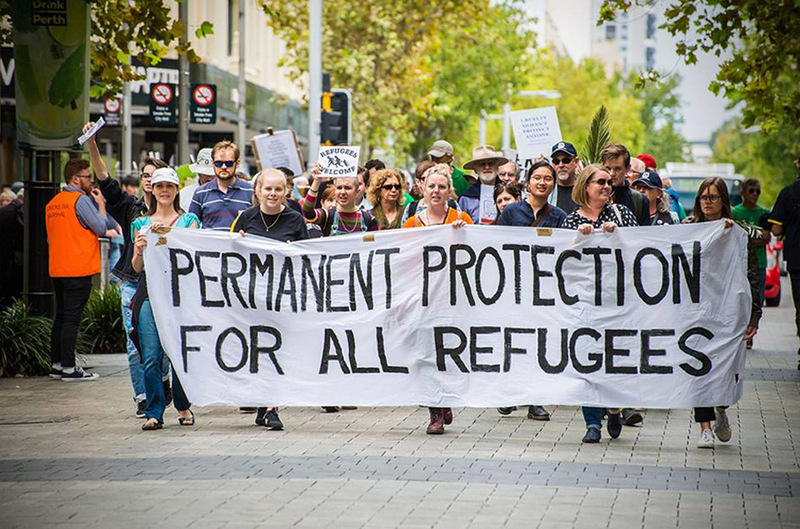 Refugees, people seeking asylum and migrants who are living in the community on temporary visas are invisibilised subjects who face persistent threats to their safety and well-being. While many adjust to the constant mental pressure, others feel entrapped in a virtual zone of terror where the risk of re-detention, deportation and destitution are omnipresent. Despite living outside a detention centre, they remain unfree, subject to indefinite insecurity. For many of these invisible detainees, their mental suffering becomes weaponised, part of the constant pressure to self-deport. For some, the unrelenting sense of insecurity has proved to be a form of slow killing, an outcome of policies that refuse asylum and enforce a state of permanent limbo. This case study considers the cases of Khodayar Amini, Leorsin Seemanpillai, Saeed Hassanloo, Majid Hassanloo, Dr Habib Wahedy, Fazel Chegeni Nejad, Raza and Mohammad Nasim Najafi, among the several other refugees, asylum seekers and migrants on temporary visas or without status, who died while living in Australia between 2001-2017. Khodayar Amini sent this statement in a Facebook message on 17 October 2015, the night before his death. An accompanying message read ‘You can translate post in all media’. I Khodayar Amini write the following few sentences with my blood for those apathetic so-called human beings. Yes they did this to me, with slogans of humanity, sentenced me to death. My crime was that I was a refugee. They tortured me for 37 months and during all these times, they treated me in the most cruel and inhumane way. They violated my basic human right and took away my human dignity with their false and so called humane slogans. They killed me as well as many of my friends such as: Nasim Najafi, Reza Rezayee and Ahmad Ali Jaffari. They were my friends and their crime was that they had sought asylum in Australia. I write this statement with my blood for those who call themselves human beings, I ask you to stand up for the rights of refugees and stop people being killed just because they have become refugees. Humanity is not a slogan; every human being has the right to live. Living shouldn’t a crime anymore. Red Cross, Immigration and the Police killed me with their slogans of humanity and cruel treatments. Vigil to mark the one year anniversary of Khodayar Amini’s death, Whadjuk Nyoongar Country (Perth), 2016. Photo: Marziya Mohammedali. 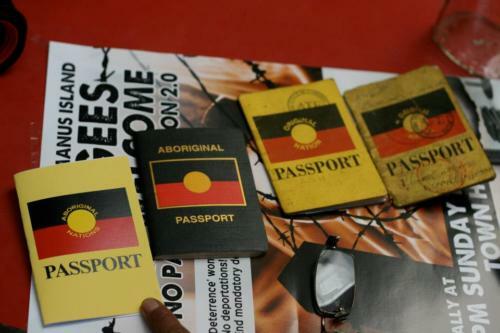 Uncle Robbie Thorpe holding Aboriginal passports at ‘Sovereignty and Sanctuary‘ (hosted by First Nations Liberation, RISE and WAR), Narrm, 2016. Photo: Charandev Singh. Also see event video. Settler colonialism is principally focused on a ‘logic of elimination’ (Wolfe, 2006), the symbolic and literal removal of Indigenous peoples from the land. Settler colonialism has been recognised as a factor in continuing Indigenous crises of ill-health and disadvantage. Historical loss, historical trauma and historical consciousness, as well as collective, intergenerational or multigenerational trauma are known to operationalise the impact of colonisation on Indigenous peoples (Paradies, 2016). In 2016, 162 Aboriginal and Torres Strait Islander people died as a result of suicide, this was at a rate of twice that of non-Indigenous people. Between 2012-16 intentional self-harm was the leading cause of death for Aboriginal and Torres Strait Islander people between 15-34 years of age. Youth suicides, including of children as young as 10 years old, has been particularly devastating for affected communities. The process of colonisation continues to traumatically disrupt sources of social and emotional wellbeing within cultures, communities and families, resulting in intergenerational mental health impacts. White supremacy, racism and other forms of social exclusion have a deleterious influence on mental health. The weaponisation of mental suffering is one means to achieve the objective of the settler ideology: to clear the land and exterminate the Indigenous presence. Palm Sunday Walk for Justice for Refugees, Whadjuk Nyoongar Country (Perth), 2016. 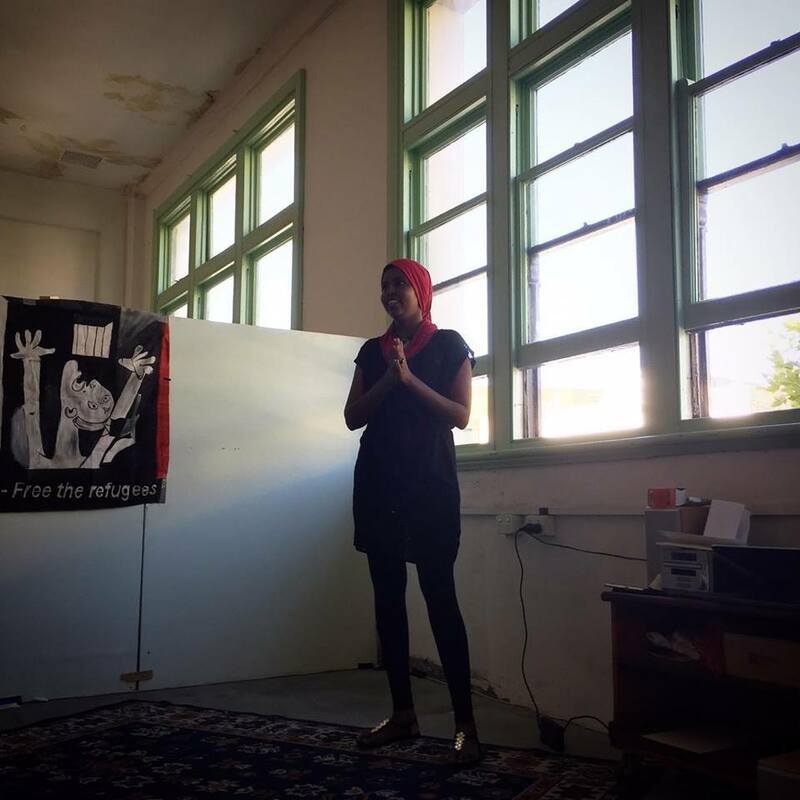 Photo: Marziya Mohammedali. The security of the settler state is predicated on the usurpation of Indigenous sovereignty and control over the borders. The weaponisation of mental health relies on two differentiated but related strategies to achieve these ends. For Indigenous people these strategies include internal sequestration, displacement from country, the destruction of community and family structures and relentless racism. In the case of refugees and asylum seekers, the weaponisation of mental health takes the form of isolation within the community, stigmatisation and the drive to self-deportation. A suite of so called deterrence policies, including detention, temporary protection and the prohibition of family reunion, are factors that drive people to self-deportation to danger or to other desperate measures to remove themselves from the place where their suffering has become intolerable. ‘No More Border Deaths!’, Close the Camps Action Collective, Naarm, Kulin Nations, 2018. Photo: Charandev Singh. The concept of ‘racialized legal status’ developed by Asad and Clair (2018) is relevant to the plight of people in community detention–effectively a state of administrative detention. Asad and Clair argue that the law serves as a fundamental mechanism of social stratification so as to produce health and psychosocial disparities in the population. These disparities are understood in the context of the material and symbolic exclusions entailed by criminal status and immigration status. Both these categories are relevant to those refugees and asylum seekers marked as ‘illegals’, with the spillover effects also impacting on the health of their families and communities. ‘Racialized legal status’ applies to asylum seekers living in the community in Australia, particularly those included in the Legacy Caseload, some of whom have been waiting in excess of five years to have their refugee claims assessed. This group has been described as occupying a state of lethal hopelessness. Instead of providing sanctuary, the state of being in temporary protection or under community detention can induce a sense of perpetual insecurity. For many, the conditions of temporary status prove so unliveable that they feel impelled to give up their hopes of building a life for themselves and their families in Australia. Increasingly, the outcome of using peoples’ psychological vulnerabilities as a means of ‘deterrence’ has resulted in suicide, as well as self-deportation: another form of ‘removal’ from Australian soil. These, too, are deaths in the custody of the state. #Human Rights Day #SOSManus/MOVEment for Human Rights Blockade, Narrm, Kulin Nations (Melbourne) , 2017. Photo: Charandev Singh. Vigil for Khodayar Amini, Whadjuk Country (Perth), 2016. Photo: Marziya Mohammedali. ”We have been forced into isolation’: life on a bridging visa’, The Guardian, 2016. Video: Abdul Karim Hekmat and Josh Wall. The conditions of bridging visas exclude people from fully participating in society, resulting in social isolation and mental distress. From late 2011, people seeking asylum in Australia started being released from immigration detention prior to their claims for protection being finalised. People who arrived after 13 August 2012 who were granted Bridging Visas were all denied the right to work (Fleay and Hartley, 1034). This forced people to try to survive below the poverty line on Status Resolution Support Service (SRSS) payments that equated to only 89% of the Centrelink Newstart allowance. In April 2015, work rights were introduced; however, by the following year there were still thousands of people who remained without them (Fleay and Hartley, 1032). Following the introduction of work rights, short visa grant periods have exacerbated barriers to securing employment. Precarious immigration status heightens vulnerability to exploitation, unfair working conditions and a continuing sense of insecurity. 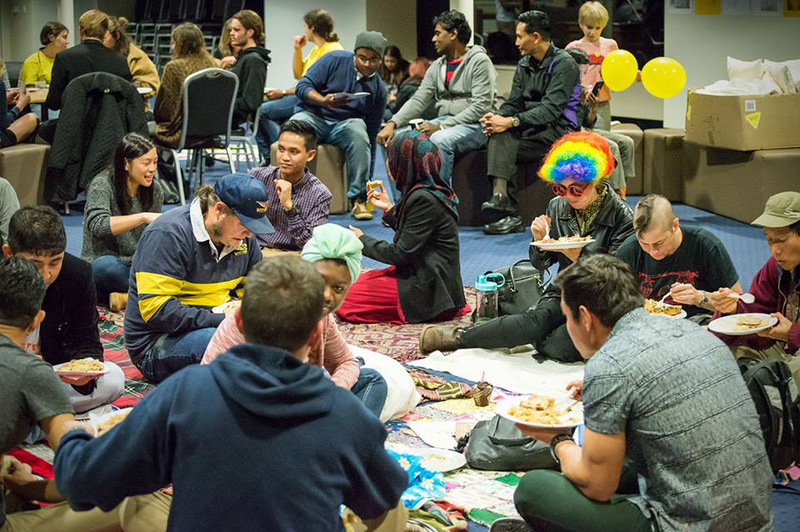 Communities of support mobilised to assist refugees on bridging visas with donations, volunteer legal and social assistance, opportunities for training and education, fostering networks of solidarity, friendship and love. Despite these strong bonds of support, however, some asylum seekers and refugees experience deep suffering and isolation. One of these cases is that of Leo Seemanpillai (discussed below), who, despite significant local support, was overwhelmed by intolerable fears of deportation. Elcho Island dancers supporting Timorese vigil at the Indonesian consulate in Darwin after the Santa Cruz massacre, 1991. Photographer: unknown. Read more. Bridging visas can be granted for a period of months or years and potentially renewed indefinitely, leaving people in limbo for prolonged periods. Following the Santa Cruz cemetery massacre in 1991, hundreds of people from East Timor sought asylum in Australia. The majority ended up in Melbourne living in the community on bridging visas. Some battled for more than a decade to be recognised as people to whom Australia owed protection. Ultimately the majority were granted permanent residency in 2005. However, a smaller group of about 50 people continued to struggle to stay in the country for years longer. 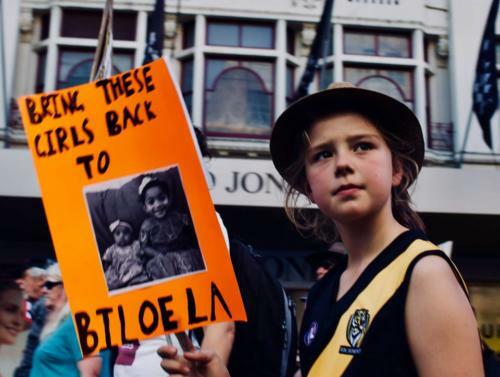 A study considering the wellbeing of East Timorese women asylum seekers residing in the Australian community found that insecurity of tenure and living with the fear of forced removal significantly affected and dangerously compromised their wellbeing (Rees, 2003). ‘Balan’s story – an asylum seeker in western Sydney’, Vimeo, 2013. Video: Tom Greenwood. Bridging visas force people seeking asylum — whether they arrive by boat or by plane — to occupy a prolonged sense that they belong neither here nor there. While these visas are a preferred alternative to detention, they do not provide freedom; they impose a myriad of other restrictions. ‘Although the borderscape is a material geography of oceans, coastlines and spaces of indeterminate sovereignty such as offshore camps, the border at the same time operates through bodies and invisible lines of demarcation, and through technologies of isolation, abandonment, exclusion’ (Perera, 2016). Bridging visas function as open air prisons. While the forms of confinement they enforce are not as evident as those of razor wire and steel fences, they produce similar effects over time. Bridging visa holders are pushed to the margins of society; the conditions of their visas are designed to prohibit full participation and foster social isolation. In a study involving people seeking asylum who arrived by plane, mental health professionals found that the refugee determination process can result in a clinical syndrome they term protracted asylum seeker syndrome. ‘Peter – Stories from Detention’, They Cannot Take the Sky: Stories From Detention Exhibition, 2017. Video: with thanks to Behind the Wire. ‘The Process of Seeking Protection’, RACS. To date, around half of peoples’ initial protection applications for TPVs and SHEVs have yet to be finalised. Some people who were among the first to apply for and be granted 3 year TPVs will soon have to resubmit TPV applications. The process is slow and the issue of renewals is likely to result in an ongoing backlog of applications. In December 2014, the Migration and Maritime Powers Legislation Amendment (Resolving the Asylum Legacy Caseload) Act 2014 was passed. It introduced two types of temporary protection visas: a 3 year TPV (Temporary Protection Visa or a 5 year SHEV (Safe Haven Enterprise Visa). The process of applying for one of these visas was changed to reduce access to the right of appeal and limit the ability to provide further information, placing significant pressure on the initial application. Previously available government funded legal assistance to apply for these visas was cut, resulting in long waiting lists for the services of free community legal centres. At the time that this Act was passed, there were about 30,000 people living on bridging visas in Australia, most of whom had arrived after August 2012 when processing of asylum claims was frozen. For years they had been waiting to be invited to apply for a protection visa. Slowly, through 2015 and 2016 invitations were sent out. In May 2017, Immigration Minister Peter Dutton announced an October 1st deadline for all applications to be submitted. People were threatened that if they did not meet the deadline they would be deported. Perth Stands for Sanctuary #LetThemStay, Whadjuk Country, 2016. Photo: Marziya Mohammedali. In August 2017, a group of about 70 people living in community detention after having been transferred to Australia for medical treatment from Manus and Nauru were issued ‘final departure bridging visas‘ without any notice. They were told that their SRSS payments would cease immediately and that they had 2 weeks to find accommodation. In May 2018 another group were subject to a similar decision. Increasingly, people who are waiting for a decision on their protection visa application or who have received a negative decision on their visa application and exhausted appeal avenues are being ‘starved out’. Many of those who are on ‘negative pathways’ are denied the right to work and have been cut off from SRSS payments, forcing them to rely on charity or face destitution. The most recent attack on bridging visa holders has been the decision to cut income support in the form of SRSS payments for those considered to be ‘job ready’. This is likely to impact thousands of people across the country. International money transfers are also being tracked and those found to be sending money overseas to support their families are at risk of having their SRSS payments cut off. Decisions like these are calculated to diminish peoples’ ability to live in the community. The ultimate objective, again, is self-deportation. Australia is not unique in using enforced poverty and destitution as a means to punish asylum seekers. In the UK people seeking asylum do not have work rights, but are provided with accommodation (by private contractors like Serco and G4S) and a small living allowance. After being granted leave to remain (refugee protection) this support is cut off after 28 days, resulting in increasing numbers being forced into destitution. 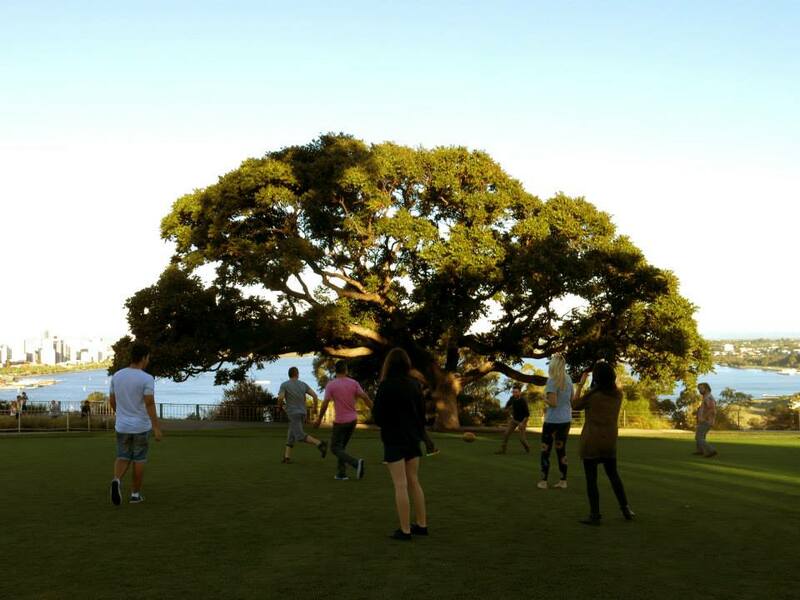 ‘The Helping Hands that Opened my Heart’. Artwork: Sayed M. Hussaini. Published in Pictures in my Heart: Seeking Refugee – Afghanistan to Australia by Fiona Hamilton. Akin to the offshore processing regime, bridging visas are designed to weaponise mental health and force people into unliveable conditions. Many deaths of bridging visa holders have been named as ‘self-inflicted’ harm; however an argument can be made that they are caused by state-inflicted-harm. Some of their stories are discussed in this case study. Hani Abdile | Refugee Poet – ‘I wonder’, 2017. Film: Yeoseop Yoon and Christopher Miles. There are many people living on bridging visas who resist the persistent attacks on their rights, their safety and their wellbeing. Despite significant personal risk and the fear that being publicly critical of the government could impact negatively on their visa applications, or result in a breach of the code of behaviour, bridging visa holders have continued to seek justice and defiantly spoken out about their experiences of seeking asylum in Australia. 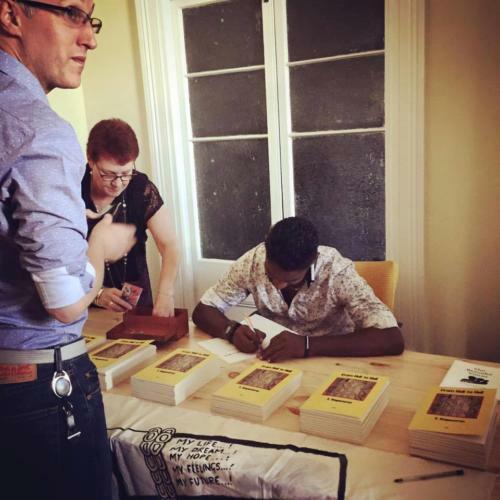 This has included speaking to the media, participating in community outreach and publishing works of art and literature: Hani Abdile, a young Somali woman, published her book of poetry ‘I Will Rise‘ in 2017 and Ravi, a Tamil man who was detained on Nauru and in Australia, released his book ‘From Hell to Hell‘ in 2016. 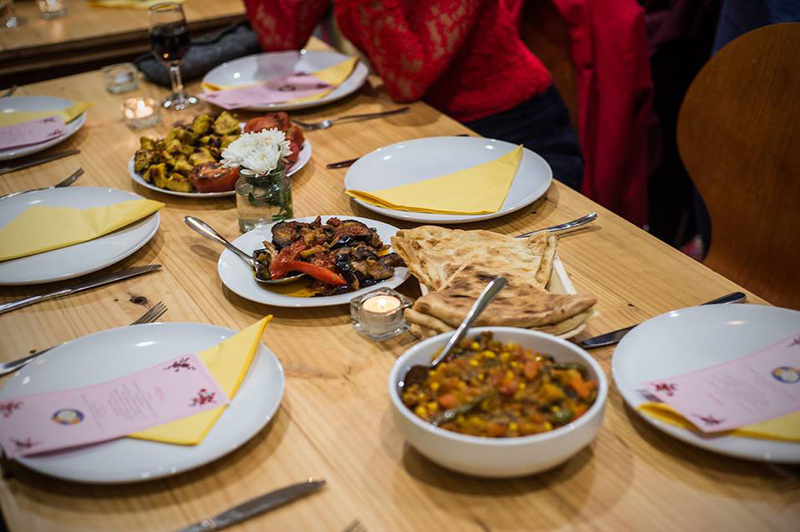 Food for Thought Dinner – Persian Feast, Centre for Stories, Whadjuk Nyoongar Country, 2016. Photo: Marziya Mohammedali. While there are intentional barriers put in place to prevent asylum seekers from connecting with the broader community, there are also examples of people overcoming these barriers. An example of this is Tamil Feasts, a social enterprise that brings people together over a meal and provides employment for Tamil men who have recently been released from detention and settled in Melbourne. 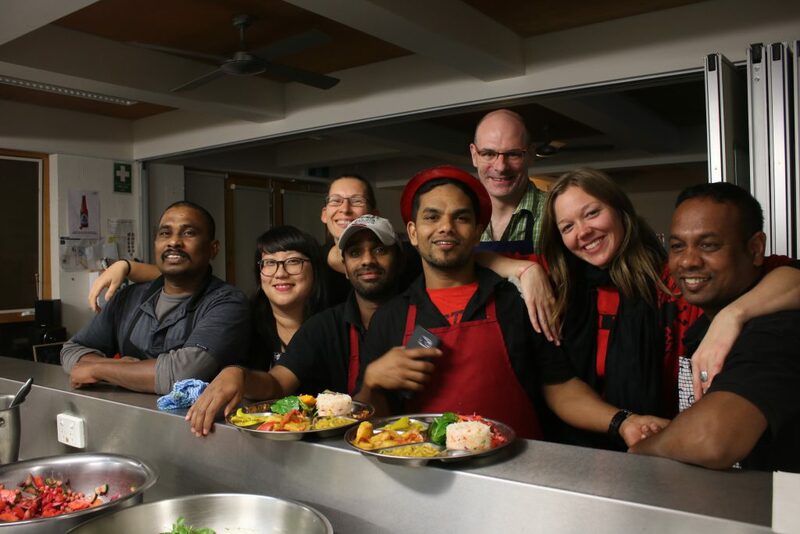 In Sydney, the café Parliament on King similarly provides employment and training opportunities in hospitality for people who’ve recently settled in Australia. Initiatives like these, while often small, are examples of people challenging government policies that seek to punish, isolate and marginalise refugees. ‘Gone Girl’, Australian Story, 2016. 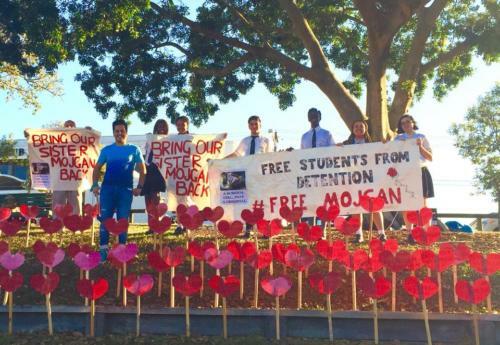 Iranian asylum seeker and graduate of Yeronga State High School, Mojgan Shamsalipoor, has been publicly advocating for her right to remain in Australia. Her school community has rallied around her in support. When she was detained, the #FreeMojgan campaign was launched alongside Mojgan and her husband Milad, to allow her to continue her education and call on the Minister to intervene and allow her return to the community. Mojgan was eventually granted a bridging visa to live in the community with her husband, who is now an Australia Citizen. Since graduating, she has been employed at the school as a teaching aid. The campaign to let her stay in Australia permanently with her husband continues. Samad, centre, wearing a red jacket and Afghanpakul, is a 19-year-old Hazara asylum seeker who lives on a bridging visa in western Sydney. His friends – including Rahim, left, and Shukrullah, right – who arrived at the same time have been granted permanent protection visas, but Samad’s application was delayed until after the legislative changes of August 2012. He has been living on a succession of bridging visas since then and has been told he will never be granted permanent protection. Swinging between anger and uncertainty, he asks why he has been treated differently, 2016. Photo: Abdul Karim Hekmat. Published in The Guardian. Leo Seemanpillai was 29 years old when he died by self-immolation in Geelong in 2014. He arrived in Darwin by boat in January 2013 and had been living in the community on a bridging visa for about a year at the time of his death. His suicide was described by then Minister for Immigration, Scott Morrison as a ‘tragic incident’. In the days following his death, hundreds of people attended a memorial service for Leo at the church he had become part of. His parents, who live in the refugee camp in Tamil Nadu where Leo grew up, were denied visas to bury their son in Australia. Some commentators argue that such acts are misidentified as ‘self-harm’—rather they are an extension and material expression of the harms inflicted by the state on the bodies of refugees. It was terror at the prospect of forcible deportation and dread of what awaited him should he be sent to Lanka that so possessed Leo that he made the decision to turn himself into a living pyre rather than face that fate. His friend, Cathy Bond, his Australian mum as he called her, was unshakable in the conviction that it was the fear of deportation that motivated Leo. “He knew what being returned to Sri Lanka meant for him . . . He spoke of nothing else but his terror of being returned.” To burn himself to death was to ensure the impossibility of a yet more agonising fate, to choose the certainty of no-return. Leo was burning his boats. 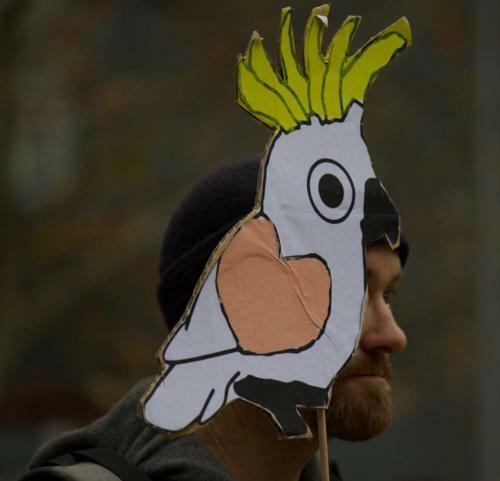 Solidarity from Manus Island, 2014. Vigil for Saeed Hassanloo, outside Royal Perth Hospital, Whadjuk Country, 2015. Video: Zebedee Parkes for Green Left Weekly. Longer video from Rez Nez available here. Photos from Marziya Mohammedali available here. Saeed and Majid Hassanloo were brothers who both fled Iran and sought asylum in Australia by boat in 2010. After more than four and a half years in detention, in early 2015, 25 year-old Saeed began a hunger strike while detained at the Yongah Hill Immigration Detention Centre. He was hospitalised and started refusing fluids when his older brother Majid, who had been detained with him, was transferred to Christmas Island. Immigration Minister Peter Dutton characterised the hunger strike as ‘emotional blackmail’. Dozens of people gathered outside Royal Perth hospital in support of Saeed. After more than 40 days on hunger strike and close to death, Saeed accepted medical assistance. Following Saeed’s recovery he was released into the community on a bridging visa. Just over a year later, he suicided while living in Tasmania. Less than a year after Saeed’s death, his brother Majid, who had also been released from detention and eventually ‘found to be a refugee’ was found dead in Sydney. These two brothers who arrived in Australia together, were, at every step, denied the sanctuary they had hoped for. Vigil for Saeed Hassanloo on Nauru, 2015. Solidarity from Manus Island, 2015. ‘Belonging Post-Villawood‘ comic, 2015. Artwork: Safdar Ahmed. ‘Second Jail’, 2003. Artist: Saeed Kazim Mosawie. Published in Pictures in my Heart: Seeking Refugee – Afghanistan to Australia by Fiona Hamilton. 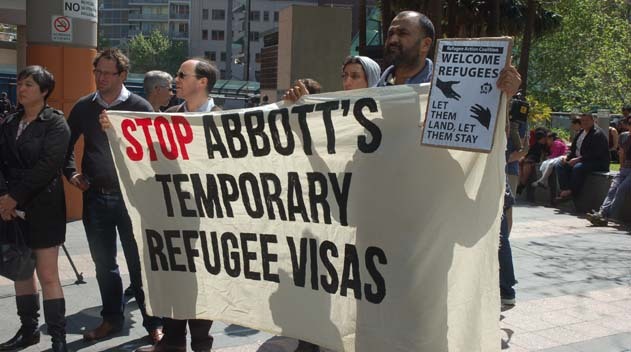 The provision of temporary protection visas is an explicitly punitive course of action that has been justified as a technique of deterrence. First introduced in October 1999, TPVs were in effect until 2008, when permanent protection was re-instated. In December 2014, temporary protection was re-introduced and remains in effect. A recent report ‘States of Refuge’ by Liberty Victoria’s Rights Advocacy Project highlights barriers that people on temporary visas face in accessing information and services relating to health, housing and education. Temporary Protection Visas enforce a permanent state of limbo. They keep refugees in a state of ‘chronic anticipatory stress’, which reduces the effectiveness of typical mental health support regimes. TPVs structurally preclude the possibility for refugees to project their lives into the future. Through the deployment of TPVs, the concept of ‘hope’ is eroded and the word ‘future’ effectively abolished. ‘K’, ‘Christmas Island Boat Tragedy’, Refugee Art Project, Exile Series. Among the most destructive effects of Temporary Protection Visas is that they deny access to family reunion programs. This means that if a father has made a boat journey to Australia hoping to subsequently be able to safely reunite with his wife and children, he is unable to do so. If families do not want to endure prolonged separation, the only option is for all members of the family to undertake the boat journey, a perilous exercise. This reality was borne out in the case of SIEV X in 2001, where most of the 353 people who drowned were women and children who had family members living in Australia on TPVs. Now that asylum seeker boats are being turned back, women and children are forced to remain in vulnerable circumstances in their countries of origin, where their safety may be at risk, or in transit countries where their rights and freedoms are not protected. Meanwhile men who are separated from their families experience hopelessness, guilt and shame at not being able to reunite with those they seek to protect. Asylum seeker Zaman chooses a quiet corner in his crowded share house to speak to his wife and daughter in Afghanistan, 2016. Photo: Abdul Karim Hekmat. Published in The Guardian. ‘The Crying Sky’. Artwork: Murtaza. In 2003, a number of Hazara men on TPVs were living and working in the small town of Murray Bridge on Ngarrindjeri land. Dr Habibullah Wahedy, a father of four, was a natural leader in his community, held in high regard by his peers. He had received a letter telling him that following the expiration of his TPV, he should return to Afghanistan. His struggles as a Hazara refugee, the ‘mental pressure’ he was experiencing and the intolerable pain of family separation were contributing factors to Dr Habib Wahedy’s suicide (Hamilton, 2015). The government’s self-serving responses to Questions on Notice regarding this death deflected blame away from the Department and instead attributed its own failure to Dr Wahedy and friends who had not compelled him to access psychological support services. A submission to a senate inquiry by LV Nayano Taylor-Neumann detailed how refugees living in Murray Bridge were struggling with the TPV regime. Artist: Mohammad, Refugee Art Project. From December 2013, any asylum seeker who is granted a bridging visa has been required to sign a ‘Code of Behaviour’. This code functions partly as a rhetorical tool that perpetuates the myth that people seeking asylum are dangerous and pose a risk to the broader community and to so-called ‘Australian values’ (Methven and Vogl, 2014). This expansion of state surveillance, discipline and control also increases the fear and insecurity experienced by asylum seekers who could potentially face indefinite incarceration for breeches, such as ‘anti-social behaviour’, that for citizens would incur little or no consequence. The provisions of the code are very broad and extend well beyond existing Australian laws. Upon release from detention, the prospect of being re-detained continues to haunt people and provisions such as the Code of Behaviour function as a tactic of intimidation, control and punishment. Section 501 of the Migration Act which includes reference to a ‘character test’, has increasingly been used to cancel or refuse visa grants. For people who are subject to non-refoulement obligations, section 501 can effectively impose a sentence of indefinite incarceration. There are several people who have died in detention or in the community who were either subject to a section 501 finding or feared imminent revocation of their visa on ‘character’ grounds. Seong Ho Kang was a man from Korea whose visa had expired. When two immigration officers arrived at his doorstep he ran towards the road, stumbled and was hit by a taxi. Wah Aun Chan, a man from Malaysia, similarly was without a valid visa when he was stopped by police for a random breath test. Following an altercation with police he was capsicum sprayed and attempted to run away towards the River Murray Cliff face. Days later his body was found at the bottom of the cliff. Hock An Ong was another man from Malaysia who was without a valid visa when police and immigration authorities raided the orchard where he was working. As he attempted to flee he suddenly collapsed and suffered a heart attack. Rezene Mebrahta Engeda, a thirty-five year old asylum seeker from Eritrea, knew the implications of a letter calling him into a meeting at the Immigration Department office. He did not make it to the meeting and later that week his body was found in the Maribyrnong River. He was not the first young Black man to drown in that river. Michael Atakelt who arrived in Australia in 2006, was last seen on 26 June 2011 following his release from a police lock-up. His body was found in the river on 7 July 2011. Further details can be found in the Inquest findings available in English and Tigrinya . Khodayar Amini and Raza Rezayee both had encounters with the police prior to their deaths. Both men would have been acutely aware that these encounters could result in the cancellation of their visas and re-detention. The death in detention of Fazel Chegeni Nejad (discussed below), a refugee denied a visa on ‘character’ grounds after being briefly released into the community, is a memory that haunts people who do not have permanent status. Manus protest, 2017. In mid-2015, after two years in detention on Manus Island, PNG, a Syrian asylum seeker signed an agreement to return to a war zone due to grave fears for the well-being of his wife and young daughter. He returned to discover that his home had been bombed. At this time the Australian government had agreed to resettle an additional 12,000 refugees predominantly from Syria, but Syrian asylum seekers held on Manus or Nauru were not considered for resettlement under this arrangement. By October 2017, there was only one Syrian man remaining on Manus Island. 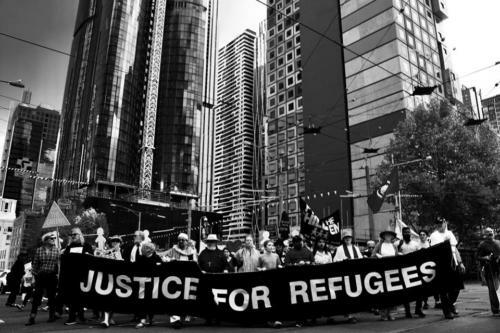 Yet, over their years of incarceration on Manus and Nauru, there have been several occasions where people detained in the camps have responded to acts of violence and persecution in their home countries, to articulate solidarity and highlight the reasons why they fled and remain unable to return. 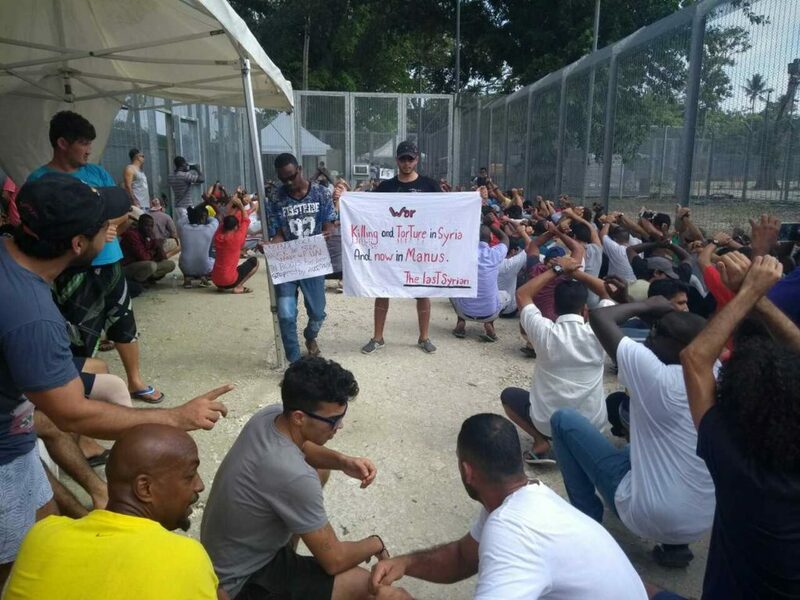 In 2017 members of the Parachinarian community protested on Manus and Nauru, the Rohingya community protested on Manus (Mohammad Imran has wrote several articles highlighting the plight of the Rohingya while the experience of another man, Faisal, is told in an article by Abdul Hekmat). 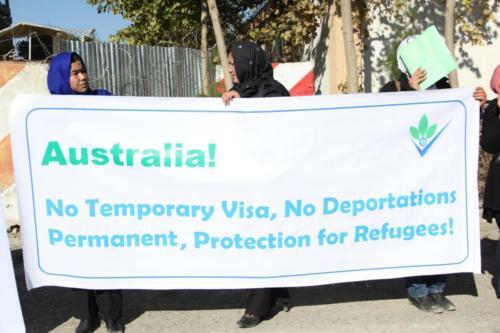 On Manus, Iranians protested in solidarity with protesters in Iran at the time. Cartoonist, Eaten Fish has responded on multiple occasions. ‘I Stand with Iran’, 2017. Artwork: Eaten Fish. ‘I Stand with Kabul’, 2017. Artwork: Eaten Fish. ‘Voluntary return’ is one of the objectives of the government for those asylum seekers it detains, either in the community on temporary visas or exiled offshore. People are coerced into signing declarations seeking return to their countries of origin. Intolerable conditions, loss of hope for the future and an inability to see another way out have compelled many to self-deport. This does not necessarily mean it was safe for them to return. In some cases people have attempted to seek asylum elsewhere and often remain in precarious circumstances there. In others, people have been offered large sums of money to return, in effect, a form of bribery. Those who received negative refugee status determinations have been involuntarily sent back, and some of them have been forced into hiding upon their return. Some of the asylum seekers forcibly returned to their countries of origin during the first iteration of the ‘Pacific Solution’ in the early 2000s were deported to a death sentence, while others, a decade later, were found to still be without safety and security. A few Afghan asylum seekers who were detained on Nauru and returned to Afghanistan were compelled to again seek asylum in Australia. Artwork: Soolagna M Creative, 2018. ‘Let Them Stay’, Narrm (Melbourne), 2018. Artwork: Van T Rudd. For people living in the community on a bridging visa, a negative decision on their protection visa application, or failure in a court of appeal, can result in re-detention and imminent deportation. Border Force can raid a person’s home at any time and whisk them away. In July 2018, a Tamil father was deported to Sri Lanka, despite his 10 month old child and wife being granted a SHEV. The separation under these circumstances, which has been condemned by the UNHCR, could be permanent, or at best for the foreseeable future. Only weeks following the traumatic death of Saruuan Aljhelie at Yongah Hill IDC and the ensuing unrest, a Tamil man was taken from the centre and deported with a dozen other men on a Skytraders charter flight to Sri Lanka. Just days later, an Iraqi man who had a Federal Circuit Court hearing scheduled for the following week was suddenly deported. 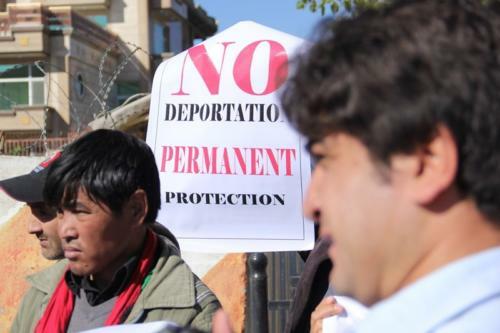 There have been several publicly reported cases of people who have feared re-detention and deportation as a result of the threat of persecution in their countries of origin. This has included a Hazara man who feared persecution at the hands of the Taliban, two Christian asylum seekers who feared return to Egypt and a Tamil man who feared torture in Sri Lanka. 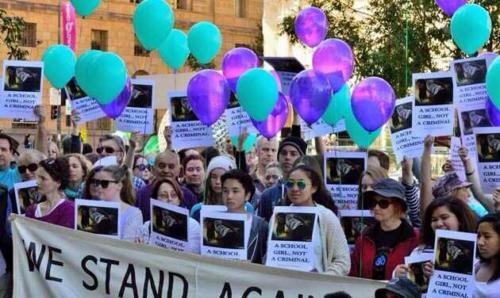 Solidarity protests for Priya and Nades, Narrm, Kulin Nations (Melbourne). Photo: Charandev Singh. 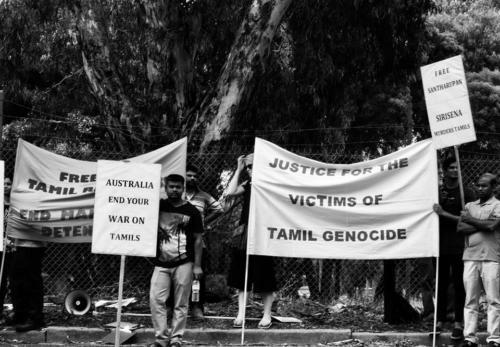 In early 2018, a Tamil family of four – Priya, Nades and their two daughters, happily settled in the small Queensland town of Biloela, were taken from their homes and detained in another state away from their community. A year later they remain in detention and have only narrowly avoided being returned to Sri Lanka after losing their immigration appeal. Despite what appears to be a grim outlook for the family, their community have provided some hope through an energetic and impassioned campaign for them to be freed and allowed to return to Biloela. As government policies become increasingly punitive, community responses have also expanded. A website, facebook page and online petition have all been launched to support the campaign and promote activism around the family’s case. Rooftop Protest at Yongah Hill Immigration Detention Centre, Ballardong Noongar Country (Northam), 2015. Photo: Marziya Mohammedali. Vigil in Melbourne Immigration Transit Accommodation (MITA), 2015. Fazel Chegeni Nejad was a Faili Kurd from the Ilam province of Iran. He sought asylum in Australia by boat in October 2011. In 2012, Fazel was found to be someone to whom Australia owed protection obligations. Fazel struggled with his health in detention, and in April 2013 he was released into community detention. In the same year, he faced court in relation to his involvement in a minor incident that had occurred at the Curtin Immigration Detention Centre, just months after his arrival in Australia. Consequently in December 2013 his right to live in the community was revoked. While his sentence was eventually dropped, the conviction stood, which meant he failed the ‘character test’. In early 2015, Fazel’s friend and fellow Kurd, Omid Ali Avaz, suicided while living in the community. Fazel formally requested permission to attend his funeral but his request was denied. His own mental health continued to deteriorate while repeated pleas for intervention on his case went unheeded. Protest on opening day of Fazel Chegeni Nejad’s Coronial Inquest outside Central Law Courts, Whadjuk Nyoongar Country (Perth), 2018. Photo: Michelle Bui. While Reza Barati, a fellow Kurd, was brutally beaten to death on another remote island, Fazel was ‘killed slowly by the machinery of detention itself‘. In November 2015, Fazel escaped from the Detention Centre on Christmas Island. Two days later his body was found in bushland about 50m from the perimeter fence. Fazel Chegeni Nejad’s death was subject to a Coronial Inquest held in Perth this year. At the time of Fazel’s death, he had spent 1477 days in immigration detention. Despite evidence from Department of Immigration Case Managers that he was on a ‘positive pathway’ there was no clear timeline or guarantee that Fazel would ever be released into the community. The inquest principally focused on the period immediately prior to Fazel’s escape and death, repeatedly refusing to discuss more systemic issues. What it did highlight, however, is the banal machinery through which the system of immigration detention functions. As the unwieldy patchwork of bureaucratic processes and commercial considerations held by the Commonwealth and its private contractors – Serco and IHMS – were examined, it became apparent that Fazel was merely another body to be subjected to routine processes that paid merely pro-forma attention to his safety. The hearings revealed serious failings in the medical, security and oversight processes at Christmas Island detention centre. The Deathscapes team wrote daily dispatches on the inquest. Vigil for Fazel Chegeni at SIEV X ‘Tree of Life’ memorial, Christmas Island, 2015. Photo: Andrew Gunnell. ‘Final Statement’, 2015-ongoing. Photo: Stephen Clendinnen. See more of Stephen’s work. Khodayar Amini repeatedly referred to the deaths of his friends, Raza and Nasim, as being intrinsically connected to his own. After hearing the news of the death of Mohammad Nasim Najafi, his former room mate, at the Yongah Hill Detention Centre he became increasingly anxious, confused and frustrated. In his final message he referred also to the death of Ahmad Ali Jaffari who had died in Villawood in 2013. He unreservedly attributed responsibility for the deaths of his friends to the Immigration Department. Deaths in custody not only affect people held in those institutions, their reverberations reach out into communities, especially in instances where it is well understood that justice will not be done for the dead through institutional processes such as inquests. In his final days, Khodayar clearly recognised that he was enmeshed in and vulnerable to the same system that killed Raza and Nasim, as it had so many others. World Refugee Day Protest, Perth Immigration Detention Centre, 2015. Photo: Marziya Mohammedali. Raza was a young Hazara man who was living in Perth on a bridging visa at the time of his suicide, after having been detained at the Yongah Hill Immigration Detention Centre. Friends who knew Raza described him at the time of his release from detention as an ‘incredibly happy person’, who liked to make jokes and deeply valued his friends. One friend described how he started to change as he struggled with being denied the right to work; she noted that over time he became anxious and forgetful. He then became disconnected from his social networks. On 16 June 2015, Raza had an encounter with the police and was held at a police station and interviewed. The following morning he suicided. Here it is worth considering the relationship between the perceived stigma associated with holding a discredited illegalised and criminalised status and the impact on health, increasing stress levels and the avoidance of institutions that might help (Asad, Clair, 2018). Shortly after Raza’s death, a question on notice was put to the Assistant Minister for Immigration and Border Protection. The response revealed that in 2014 there were 9 reported deaths of bridging visa holders and in the first half of 2015 there were 6 reported deaths of bridging visa holders. These shocking figures would have raised an outcry in any other context. Vigil for Mohammad Nasim Najafi, Whadjuk Country (Perth), 2015. Photo: Marziya Mohammedali. Vigil flyer: Refugee Rights Action Network WA. See more photos here. Mohammad Nasim Najafi was a young Hazara man from Afghanistan who sought asylum in Australia. At the time of his death, he was detained at the Yongah Hill immigration detention centre, near Northam in WA. The exact circumstances surrounding his death remain unclear, but accounts point to the denial of proper care for his epilepsy and other medical needs and his placement in solitary confinement. Questions around medical care, his treatment while in detention and the response of Serco officers were raised by his friends detained in the centre. A coronial inquest hearing was held in November 2018 and the inquest findings were published in December 2018. Vigil for Mohammad Nasim Najafi, Whadjuk Country (Perth), 2015. Photo: Marziya Mohammedali. ‘Khodayar Amini’s Final Camp’. Photo: Stephen Clendinnen. See more of Stephen’s work. just like his kite, his soul burned to ashes in the flames of hate. Khodayar’s empty bed, 2015. Photo: Khodayar’s former housemate. Khodayar Amini was a 29 year old Hazara man from Afghanistan, who had arrived in Australia by boat in 2012 in search of protection. After 5 months in detention, he was released on a bridging visa without the right to work, travel or study. In 2014, he was re-detained for 11 months following a dispute with the Department of Transport, Travel and Motoring in South Australia. He was again released on a bridging visa, this time more acutely aware of his vulnerable status in the community. Just months before Khodayar’s death, a verbal disagreement via phone with a Red Cross worker resulted in a complaint against Khodayar that was filed to the Victoria Police. Khodayar was apprehended and taken into police custody for questioning. Re-detention was a possibility he was very aware of. Shortly after this incident, Khodayar received a Court Attendance Notice. He was immediately thrown into a state of panic and confusion. At the end of September 2015 he was hospitalised. On 15 October DIBP officers came to Khodayar’s last known address to notify him of their intention to consider cancelling his bridging visa as a result of the charges against him. He was not present, though was made aware of the visit. The following day DIBP contacted Khodayar to arrange an appointment for 19 October. Khodayar called his Red Cross support worker and articulated his distress and threatened to self-immolate. Khodayar did not live to see 19 October. Photo of Khodayar Amini, date unknown, photo received in 2015. Photo: Khodayar Amini. In his final phone call, Khodayar asked his chosen witnesses to call SBS television to relay to them the circumstances surrounding his death. He asked for his messages to be translated and shared with the media. He specifically requested that the media be told that the Red Cross, the police and the Immigration Department had killed him. Khodayar sent a series of photographs of himself through to the advocates he was in contact with. The site of his self-immolation was in Dandenong, an area with a large Hazara community, hundreds of kilometres from where he had lived. His instructions were clear and his messages were targeted. He did not want his suffering to be invisible anymore; he wanted people to know what happened to him. Despite his having no known relatives in Australia, a crowd of more than 200 people gathered at the Robert Booth Reserve to remember Khodayar. Despite some public attention aroused by his death, no changes were made regarding the treatment of asylum seekers in the community. Flowers at Khodayar Amini’s grave, Northern Memorial Park, 2018. Photo: Stephen Clendinnen. ‘Dead Letters’, 2017. Photo: Stephen Clendinnen. Khodayar did not have an identified senior next of kin in Australia. No one was notified when his body was released and eventually buried more than three months after his death, in a shared grave with two others. Authorities made no attempt to communicate the burial plans to individuals who knew him, to members of the Hazara community or even to the Red Cross, despite the fact that these parties’ stated they wish to be involved. A presumption was made that he had no friends or relatives; that no one cared. There were networks of people who attempted to follow Khodayar’s case, who wanted to pay their respects and keep his memory alive; however the state institutions relentlessly sought to deny them the opportunity to do so. This prompts the question: if Khodayar’s death, which received some degree of public attention, was treated in this manner, what happens to the other invisibilised people who die while seeking safety in Australia? How many other graves have been quietly dug for people whose names will never appear on any public record? From ‘Tribunal‘, 2017. Photo: Janet Pelly. The play, Tribunal, in which an Indigenous elder presides over a case against the Australian state for its treatment of refugees, calls attention to the illegality of the state’s own system of laws. In July 2017, more than a year and a half after Khodayar Amini’s death, the Deputy State Coroner of Victoria delivered a finding without inquest. While inquests rarely, if ever, deliver justice to families or communities, it can only be viewed as an insult that the only official public record reduced Khodayar’s life to a document of barely 4 pages. The only details provided are: Khodayar’s identity, some of his movements prior to his death and the physical condition in which his body was found; little more is stated. The findings make clear that no investigation was undertaken into the systemic issues that contributed to Khodayar’s death; the document makes no attempt to contextualise his death beyond the events immediately preceding his suicide. No recommendations were made with a view to prevent others from dying in similar circumstances. It remains unclear as to whether any internal investigations or reviews were undertaken or any changes made by Red Cross, the police or the Department of Immigration. If any were undertaken, they were not included in the Coronial brief. This is indicative of the shallowness of the investigation and the seeming indifference to preventing other asylum seekers from dying in similar circumstances. Just over a week after Khodayar’s death, another young man on a bridging visa was found dead in an airport in Brisbane. Vigil for Khodayar Amini, Dandenong, Robert Booth Reserve, Dandenong (land of the Wurundjeri and Boonerwrung tribes of the Kulin Nation), 2015. Photo: Mehdi Shaheen. ‘Where’s my Refuge?’, World Refugee Day, Nyoongar Country, 2017. Photo: Marziya Mohammedali. Self-immolations by asylum seekers can be viewed as extensions to and material expressions of the harms inflicted by the state. 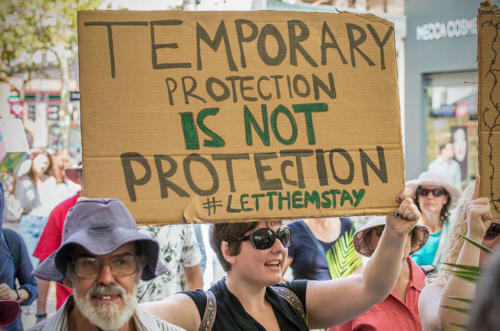 Self-immolations have occurred in immigration detention, offshore on Nauru and among those held in the Australian community — demonstrating the interconnections in the forms of violence experienced by these asylum seeker and refugee bodies, whether they are officially confined or in live in unfreedom in the ‘community’. Confronted with no prospect of escape or exit except through death, these public suicides, like self-immolations in other contexts, expose a biopolitical culture in which some are, simply, ‘not allowed to live’ (Pugliese, 2014). Public self-immolations by asylum seekers chillingly recall Australian customs’ routine practice of burning asylum seeker boats at sea. The termination of the possibility of their re-entry is a visible act of violent ‘deterrence’ that has been described as a ritual of sovereignty (Perera 2009). Whereas the state persistently attempts to expel refugees to their countries of origin and allow them to perish beyond our sight, the public act of burning oneself – ‘burning our boats’ – puts on show this hidden violence and stages before our eyes the fact of no-return. Historically, self-immolation has been a form of political protest. In June 1963, a Vietnamese Buddhist Monk self-immolated in a street in Saigon to protest the persecution of Buddhists by the South Vietnamese government. In December 2010, the self-immolation of Mohamed Bouazizi in Tunisia inspired the Tunisian revolution and the revolutions of the Arab Spring. Joseph Pugliese writes, ‘Mohamed Bouazizi clearly experienced the violence that proceeded from the functioning of Reason itself. Victim of this violence, Bouazizi embodied the individual conscience that would act to name, identify and shame the violent operations of the state’s instrumental reason. He proceeded, indeed, to assume an “infinite responsibility” that was marked by the incineration of his life as a way of calling to account the countless tyrannies executed by the civil servants of the state’ (Pugliese, 2014). As a material expression of the harms inflicted by the state on their bodies, the self-immolation of asylum seekers and refugees can be viewed as a response to policies that are intended to cause harm. They send a final message, where other expressions of suffering and attempts to seek justice were ignored before the cruelty and violence of the state is embodied in this final act. In some cases, messages left by asylum seekers and refugees or the chosen site of self-immolation have signalled – as in the case of Mohamad Bouazizi, who cried ‘If you don’t see me, I’ll burn myself’ – in part a search for visibility and accountability. Sharaz Kayani chose to self-immolate in front of Parliament House, a site symbolic of the Australian state, and Khodayar Amini’s final messages provide an explicit call for accountability and a cry for justice. Although the deaths of asylum seekers and refugees have not inspired revolution, like Mohamed Bouazizi’s did, some citizen-witnesses to these self-immolations continue to resist the state’s violence and attempt to seek justice for the dead in various ways. ‘Where’s My Refuge?’, World Refugee Day protest, outside Perth Immigration Detention Centre, 2017. Photo: Marziya Mohammedali. State-inflicted-harm throughout the process of seeking asylum is not confined to the Australian context. In the U.S. and UK there are similar documented cases of people being targeted while living in the community and placed in circumstances that produce fatal consequences. Sharaz Kayani had sought asylum from Pakistan and gained Australian citizenship in 1999. In 2001, he self-immolated in the visitors’ gallery of Parliament House in Canberra after repeated rejections of his application for family reunion. Then Immigration Minister Ruddock attempted to portray this despairing act as a coercive threat to the ‘sovereign right’ of government to make migration decisions. (Duncanson, 2002) A report by the Ombudsman investigated the refusal of Sharaz Kayani’s application for family reunion. It notes how DIMA (Department of Immigration and Multicultural Affairs) refused to exercise discretion to waive the health requirement for one of his children who had a disability, and identified ‘defective administration’ and some ‘systemic issues relating to the treatment of split family applications’. This man, who has not been publicly named, arrived in Australia in 2001, was detained at Woomera Detention Centre and released the following year on a TPV. In 2007 he suffered a workplace injury which prevented him from being able to continue working. His mental health declined, partly due to the bureaucratic processes he was subjected to in order to receive financial benefits from his compensation claim. In January 2015 he self-immolated in the reception area of a QBE office. Before self-immolating he stated ‘I only have two regrets in my life. That is my mother and father meeting and having me, and me coming to Australia from Iraq in 2001’. Ali Jaffari was a Hazara refugee who was detained at the Yongah Hill IDC following a permanent protection visa cancellation under section 501 of the immigration act. A coronial inquest investigating his death is scheduled for later this year. In addition to reported fatal self-immolations, there have been a number of attempted self-immolations. In 2014, a young Tamil asylum seeker self-immolated after receiving a negative decision on an appeal for his refugee status. Only months later, a 40 year-old Tamil asylum seeker made a similar attempt. In 2015 it was reported that a man self-immolated inside Villawood detention centre. In 2016, Hodan Yasin, a young Somali woman held on Nauru, self-immolated only days after Omid Masoumali. In 2017, a man set himself alight outside the Sydney Department of Immigration office. Alarmingly, even children on Nauru have attempted to self-immolate recently. ‘The Fire’, Refugee Art Project, Surviving Detention Series. Artwork: Kamaleshwaran Selladurai. HANI ABDILE – Stories From Detention excerpt, Tom Campbell, Vimeo, 2017. 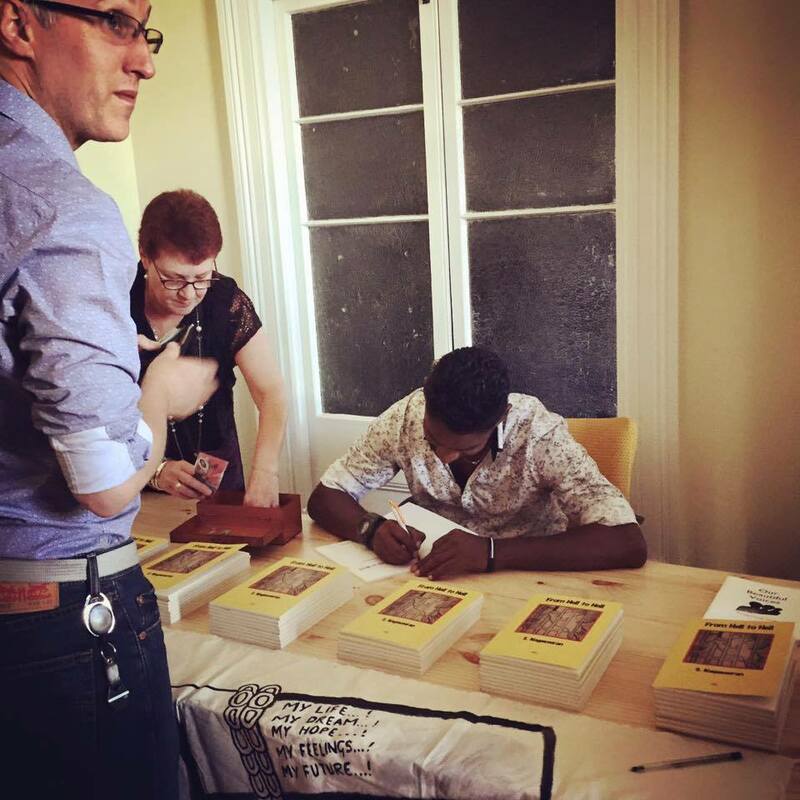 Hani Abdile at book launch of ‘I Will Rise’, Whadjuk Nyoongar Country (Perth), 2016. Photo: Michelle Bui. Ravi speaking at book launch of ‘From Hell to Hell’, Whadjuk Nyoongar Country, 2016. Photo: Marziya Mohammedali. In the context of the fraught regime of Temporary Protection Visas, and the state of perpetual insecurity that it generates for its intended targets, refugees speak back to the violence of the state through powerful and eloquent acts of writing-as-resistance. Through acts of writing-as-resistance, they attest to lives placed by the state in often intolerable conditions of irresolution that are inscribed with their own forms of indefinite detention. Through acts of writing-as-resistance, they mark the loss of their beloved friends who die waiting to escape states of perpetual insecurity and they make tangible and visible, through creative acts of agency, their refusal to remain silent in the face of the pain and loss they both witness and continue to endure. All states and territories have torture and trauma counselling services, most of which can usually be accessed by people from refugee and asylum seeker backgrounds at no cost. We understand that this case study may be distressing for some readers and encourage people to access support services if you have been affected by this case study or are experiencing other stressors. VIC | Foundation House -The Victorian Foundation for Survivors of Torture Inc.
Teenage asylum seekers play football in Granville Park, Western Sydney. Away from their families, they form tight-knit friendships and bond through sport. Some dream of playing professionally. Photo: Abdul Karim Hekmat. Published in The Guardian. This case study was collectively authored by the Australian hub of the Deathscapes project: Michelle Bui, Dean Chan, Suvendrini Perera, Joseph Pugliese, Ayman Qwaider and Charandev Singh. To cite this research: Michelle Bui, Dean Chan, Suvendrini Perera, Joseph Pugliese, Ayman Qwaider, and Charandev Singh. ‘Perpetual Insecurity: the weaponisation of mental suffering’. Deathscapes: Mapping Race and Violence in Settler States, 2018, https://www.deathscapes.org/case-studies/perpetual-insecurity.